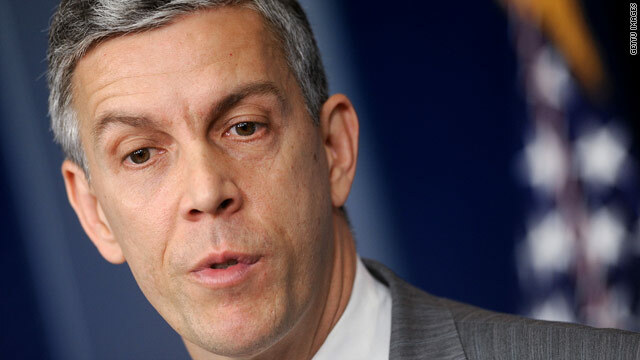 U.S. Secretary of Education Arne Duncan speaks at the press briefing of the White House on April 20. NEW YORK (CNNMoney) - The Obama administration announced a push to have colleges make better disclosures to students about the true cost of loans, as well as graduation and loan default rates at each school. Vice President Joseph Biden, Education Secretary Arne Duncan and Richard Cordray, director of the Consumer Financial Protection Bureau, were set to meet Tuesday with presidents of 10 colleges that have committed to providing more detailed disclosure information to incoming students at the start of next school year. The Obama administration officials at the meeting will later call on all colleges and universities to make the same disclosures. The information to be provided by the 10 schools includes how much one year of college will cost, financial aid options to pay this cost, and net costs after grants and scholarships are taken into account. They will also give students estimated monthly payments for the federal student loans the student would likely owe after graduation; and comparative information about the rates at which students enroll from one year to the next, graduate, and repay their loans without defaulting. « Previous entryObama and Bill Clinton together again but on the same page? Well it's a good start, not a solution to the problem but at least this will help many who just don't understand the hugh responsibility with attending college in 2012. I know this will fly like a lead baloon but how about student's paying the going rate and getting their own loans thru a lending instution and taking resopnsibility for paying it back. get the government out of it, totally. We have too many giveaway programs now. Perhaps in benefit programs yes i'll buy into cutting welfare but then again a parent has to pay for a place to live probably a car dinner electricity lord know how many payments of who knows what with the cost of college costing like 50,000 a year yeah right like all us are rich and can afford it on an average 45,000 dollar salary. You know most students on top of government grants have to take out loans as well as scholarships and take a job what you think when people have to pay 50,000 a year. and lost the state senate. That is hardly a shellacking. The most that can be truthfully said is Scott Walker has been neutered. This administration is great at one thing.....creating more of a hassle for businesses to do business. It pains me to see all of these great ideas pop up during an economic downturn. While some of these ideas are great, do we really want to add more regulations on businesses when they are already struggling? This just increases their overhead and if they make a true mistake, it costs them a lot of money in the form of an investigation or a fine. Come on Obama, stimulate the economy, not the red tape within the country! WHAT'S SO HARD? ARE YOU TRYING TO START A METH LAB? HAHAHAHAHAHA!! !